This presentation how various progress which Nexedi made in bringing Python language closer to its corporate goals in terms of performance and concurrency. You may find this presentation online by scanning the QR Code above. Rapid.Space: ERP5, buildout, re6st, etc. This presentation was inspire by a presentatoin at Europython in 2016 that showed that uvloop could lead to very fast HTTP servers, even fatster than in golang. But we later found that as soon as some python code was added, the performance dropped tremendously by at least an order of magnitude. Also, all tests we running on a single core . But golang http server runs if needed on multiple cores. We thought the results were therefore quite biased. We thus tried to find a better solution. Base on those results, we expect to extend Cython language to turn Extension Types, also known as cdef class, into a full object system independent of cpython. This way, one can use cython to develop high performance algorithms that never hit the GIL of cpython, while keeping all the benefits of easy integration with cpython. All details which have lead to above conclusions are available in the above references. Let us now dig into the rational behind our motivation to improve the concurrency and performance of Pyhton. In this section, we express Nexedi's views in an unambiguous way. Our views might be different from what is usually expressed in Python's community. Yet, they are based on the actual experience of bringing Python based large systems with million users to the market and maintain them for more than 10 years. They are also based on the observation that part of early Python adopters are leaving Python due to difficulties in adopting Python 3 or to push Python 3 language evolution in the direction they actually care most. In 2018, Python language is in our eyes as good as it was in 2000 when Nexedi selected it as its primary language (No 2 was...Ruby), due to its reflexive object system and to the existence of an object database (ZODB) based on pickles. The existence of ZODB was a key argument for us because we knew since 1993 that object-relational mapping can not work by design (despite how much people still try) and that an object database was essential for clustering and passing objects from one process to another. Python is in 2018 the favourite language of developers, which is a great news. The concurrency model of python is still very poor. Asyncio, by adding keywords to the language specification, actually imposes a specific and questionable concurrency model, that has been fashionable in the early 2010s but that is not future-proof as for any fashion. It does not provide much to handle multi-core. And it is not reflexive. In a sense, it does by changing the language something that a library could have done. And by so, it ignores to existence of solutions such as Actalk that provide a generic, universal approach to object oriented concurrent programming, able to cover all forms of concurrency: agent programming, map reduce, implicit concurrency, etc. Python is still in 2018 unusable in a web browser, either because cpython compiled into web assembly is too slow or because other implementation of python are too restrictive. The state of python in 2018 includes the state of Python 3. Nexedi just started to migrate all its code to Python 3. Yet, we see close to zero benefits of doing this, besides better long term maintenance (python2.7 maintenance will be stopped in a few months or years) and their side effect: better system libraries, new versions of libraries not released for python2.7, etc. Even if we search a lot, we can not say what Python 3 brings to our products and to our customers. Porting Nexedi's code to Python 3 has high cost. The incompatibility that was introduced with pickles (in contraction to format stability that had been specified and promised previously), the introduction of unicode strings and the use of two types (string, byte array) instead of one in Python 2, will generate a porting cost of 200 K€. We will also have to create a patch and maintain it so that we can cast byte arrays transparently into strings. Without that, we would not be able to respect our promise to customers: "no data migration". Unlike other vendors (especially those that use ORM), Nexedi does not charge customers for migrating data from on version to another, thanks to ZODB and pickles. Python 3 is slower on all our tests no mater the version. This will lead to optimisation and hardware costs. Python 3 consumes more memory. This will lead to optimisation and hardware costs. And Python 3 language PEPs are slowly turning the language, which used to be simple and minimal, into a complex and inconsistent one, especially in terms of reflexivity of the object model. This will lead to training costs, without much benefits (except maybe for optional type annotations). And lately, the Python 3 language has been subject to changed that were more influence by fashion than anything rationality and scientific state of the art. This is the case with unicode binary strings, an approach that was fashionable at the end of the 90s but that other modern languages did not adopt (they use UTF-8 strings instead). It is also the case with asyncio which introduces a low level form of concurrent object programming which is both questionable, very specific (ES6 did the same) and unnecessary (see how Actalk does). For a programming language that has to be maintained 50 years ar least, fashion is actually a plague. Instagram has adopted Python 3. But Python 3 has experienced little industry adoption, which is quite normal considering the incompatibilities it introduced. All projects (eg. GRUB 2, Zope 3) that introduced big changes from one version to the next one version to the next one, also introduced a 10 years delay in their industry adoption, or died. Breaking upward compatibility is always a huge, and possibly deadly, mistake for a software project. Not all Free Software projects are careless about upward compatibility. The Linux kernel project or glibc projects have policies to protect upward compatibility. Thanks to their policy, releasing a a new version of a Linux/glibc based software can be achieved in two steps: first quickly by recompiling as is (upward compatibility), second after some time by leveraging new features (feature evolution). This is what we could do until Python 2.7, with of course some unnecessary glitches (ex. introduction of changes in the rounding algorithm of python in contradiction with its mathematical specification). Yet, our code base could evolve quite smoothly for 15 years. Certain changes in Python 3 language prevent such a smooth evolution. Instead of spending a few weeks or months, adopting Python 3 means for us spending a couple of man year due to changes in strings, pickles and AST. If porting a big system to Python 3 or redeveloping its core from scratch have similar cost, it is natural to consider alternatives to Python 3. Dropbox for example first tried to use pypy then created pyston in order to accelerate their Django based infrastructure. Pypy did not bring speed improvements. Pyston (that was also supported by Nexedi during one year) progressed too slowly and was dropped. Dropbox instead went in the direction of rewriting core parts of its infrastructure in Go language. Google has a reputation of prohibiting the use of Python in production systems. Youtube wrote a Python to Go transpiler. Chinese cloud providers such as Qiniu heavily realy on Go language where US cloud providers would have used Python 10 years ago, and on Java in other cases. Alternative to Python 3: Go? The lack of adoption of Python 3 by the industry in areas where Python used to be strong is quite frightening for a small company like Nexedi that relies on Python. We thus conducted our own analysis. Could we switch to Go language? The answer is no because it is too costly (even more than migrating to Python 3). Also it is not that easy to interface with C libraries (not as easy as using Cython). And there is nothing similar to the PyData ecosystem. PyData ecosystem is currently the fastest growing social group of the Python community. Python libraries such as NumPy, Pandas, Scipy, Scikit-learn, Keras, PyTorch, etc. offer to developers a range of data science algorithms which no other language can offer. The answer is also no. For the same cost reasons. Cython also provides language feature called nogil whiich released CPython's GIL. Releasing the GIL is something that is used a lot by NumPy (without Cython). If you try to use NumPy on a multi-core system, you will find out that all cores are being used efficiently. You will also find a lot of nogil instructions in LXML or Scikit-Learn libraries which are based on Cython. This means that high performance programming in Python is possible: through multi-processing (as ERP5 does with wendelin.core to share variables across processes) or by releasing the GIL in Cython (as Scikit-Learn does). Yet, some kinds of software do not fit into this: those that need fine grained concurrency (like coroutines) and low latency within the same execution space. This is where go shines, until now. Based on the former cheat sheet, we have expressed some goals of improvement of Python 3 (through Cython, which is a superset of Python 3). We want compatibility, obviously, to ease adoption. Cython does that very well. We want to be as fast as C. Cython does that very well too with cdef functions and classes. We want concurrency to be as multicore a Go and as reflexive as Actalk. This is not yet the case. We have thus defined a work plan. 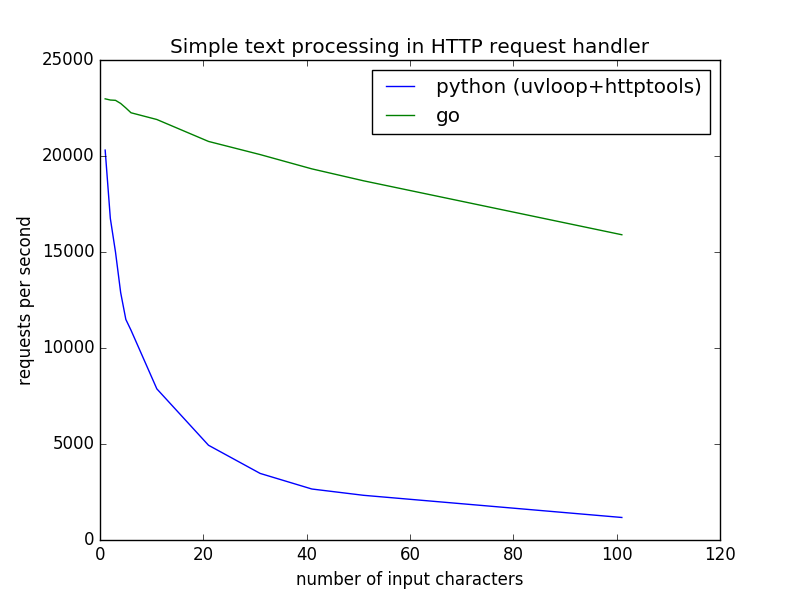 Step 1: prove that we can create an HTTP server in Python that runs faster than the fastest in Go, over multiple cores. This is done. Step 2: prove that we can run co-routines as efficient as those of Go, with work stealing algorithms. This is mostly done. Step 3: implement instanciation in Cython cdef class without depending on CPython's GIL. This is ongoing. Step 4: implement a memory manager for Cython cdef class without depending on CPython's GIL. This is ongoing. Step 5: implement a concurrency model that is state of the art. This has not started yet, but we did some experiments already through PyGolang and CMFActivity. We will now have a closer look at the code we wrote as part of Step 1 and Step 2. High performance HTTP servers are usually based on a good coroutine library. We researched all C libraries we knew, patched them to get multi-core support if needed. We compared their features. The result is shocking: there is no coroutine library in C which is covers the kind of features that go provided natively. What is even more shocking is that most coroutine libraries in C are... slower than Python with uvloop. All tests we run on a mig-range laptop with a quad-core i7 CPU. Bryton Lacquement then discovered LWAN and tried it. He wrote a Cython wrapper around it. He implemented a simple work stealing algorithm. And he achieved impressive performance with coroutines. It is likely that - if he had used a dedicated memory manager instead of malloc - if would have surpassed Go's goroutines performance. So here is how one used LWAN in practice from Python / Cython to create a Web server. Code sounds quite familiar. Defining a handler in Cython cde function requires some extra care with C types. Hopefully, by wrapping into Cython some standard library for strings (ex. C++ STL), code could look better in the future. Running LWAN is just two lines of Python. Result is impressive. LWAN based Python / Cython libraries spans across multiple cores and surpasses the fastest Golang HTTP server. It is possible to execute some dynamic code inside a handler and release the GIL. This is a standard Cython feature. Here, we execute a Fibonacci calculation. Again, result is impressive. Python with Cython scales on multiple cores and runs faster than Go. This last example demonstrates that it is already possible with LWAN wrapper and Cython nogil option to develop web application servers or cloud infrastructure services that scale as well and run as fast as Golang, yet integrate much more easily with existing code in C/C++/FORTRAN and leverage the vast legacy of Python libraries especially in data sciences.